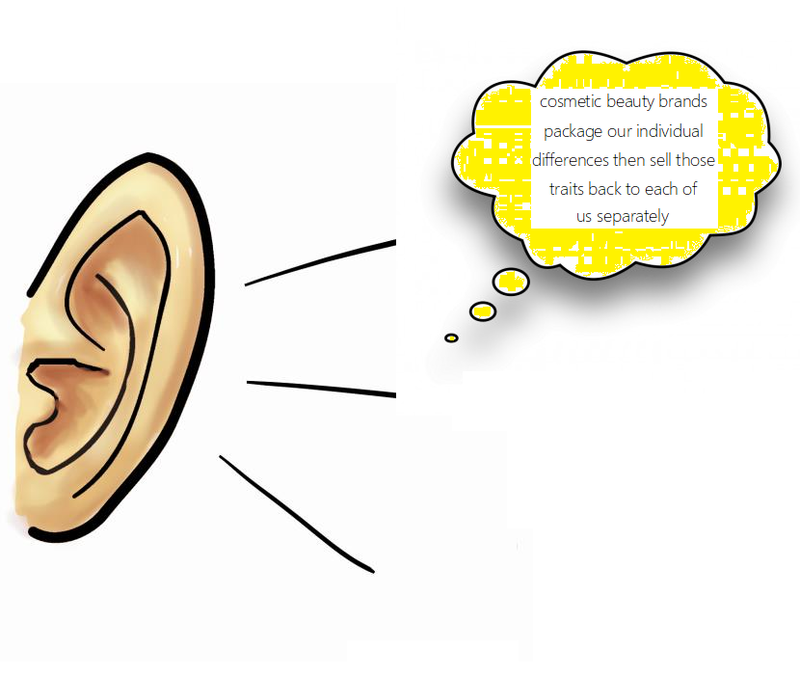 They (cosmetic beauty brands) sell us characteristics of each other. So say someone is darker skinned, they target them with bleaching creams, and if someone is lighter skinned they target them with tanning products. If someone has a thin frame they target them with cosmetic/diet products to achieve a curvier frame, and if someone is curvier they target them with diet and workout plans. They take our individual identity, package it, and market it back to each of us individually. They sell us our differences — whatever distinctive traits you have that I don't have, that's what they market to me, and whatever distinctive traits I have that you don't, that's what they market to you. These brands use insidious advertising schemes to exploit and manipulate their target demographics into conforming to a made up ideal of beauty. For example, their use of the word 'flaw' in their ad campaigns has been utilized meticulously and exhaustively to convey to people, particularly to impressionable young women and men that the differences they have from the photo-shopped ads are what makes them 'not attractive', 'not desirable', 'less than', 'other'. Even when they've used 'I love my flaws' as an empowering new motto, the several decades past of using aggressive advertising to condition young people to believe that they aren't good enough has already done far too much damage. They still associate the word flaw with a negative portrayal of themselves, it's still associated with something that they need to physically alter about themselves. What many people don't realize is that the flaws that have been advertised are simply our individual differences. Our tiny differences continue to be exploited politically, socially, and economically in ways that separate us, shatter our self-esteem, and disenfranchise us. We have to become conscious of the beauty advertisements and images that are repeatedly marketed to us. Take note of the advertising campaigns and brands that make you feel bad about yourself and stop supporting them! Enough! You and I need a few pairs of Cropped Trousers! I did a closet overhaul recently, because I'm looking to add more cleans lines, and classic silhouettes in order to enhance the versatility of my wardrobe. One of the necessary items that I realized that I no longer had was the high waist cropped trouser. Now I'm seeing them everywhere, and I'm on a mission to find a few perfect pairs for myself. 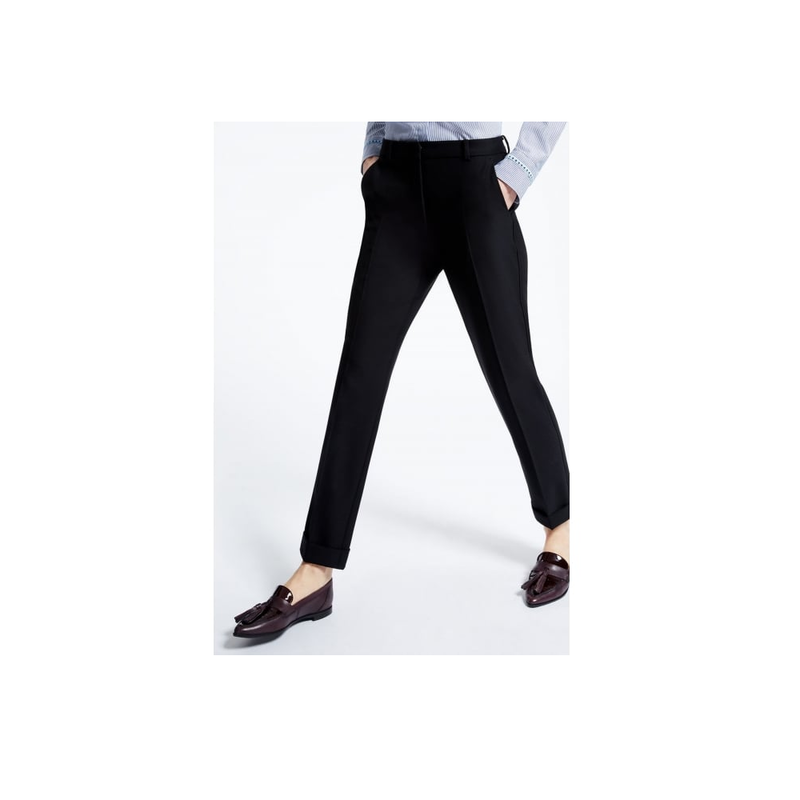 If you don't have a pair of cropped pants, promise me that you'll think about investing in a few pairs, as I plan to do so myself. 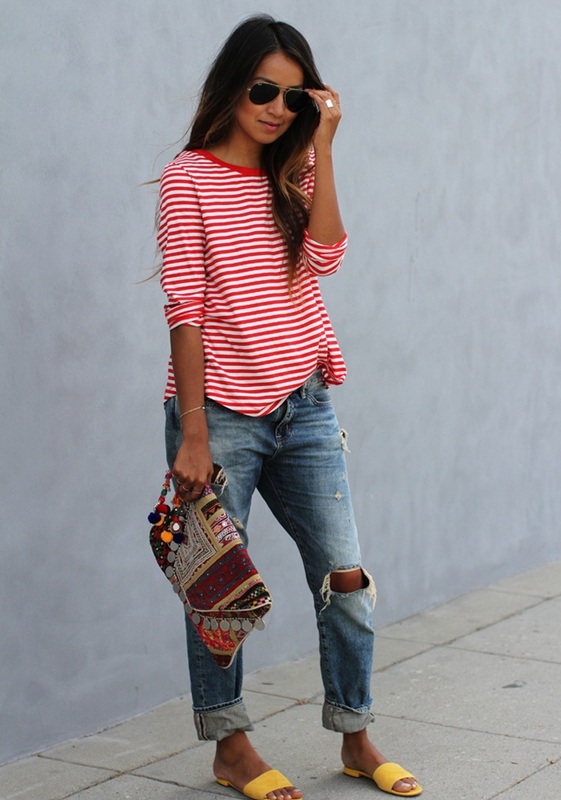 The Cropped trouser adds to the versatility of your wardrobe, it really is a "wear anywhere" item. (L-R) Salma Hayek was seen at LAX airport in June 2017 in black shorts, a blue denim jacket, a white tee, and tri-color Stella McCartney platform brogues. Ulyana Seergeenko paired her high waist pants with a crew neck sweater, black brogues, and a vintage inspired beauty look. Salma's photo: Starzfly/Bauergriffin | Ulyana's photo: Pascal Le Segretain/Getty. Dascha Polanco attended the 'Dr. Seuss' The Grinch' New York film premiere in November 2018. The actress rocked a tan cropped trouser, with a matching color coat, and a striped turtleneck. She finished off her look with understated makeup and a wine colored lip. She looked great. Photo: John Lamparski/Getty. 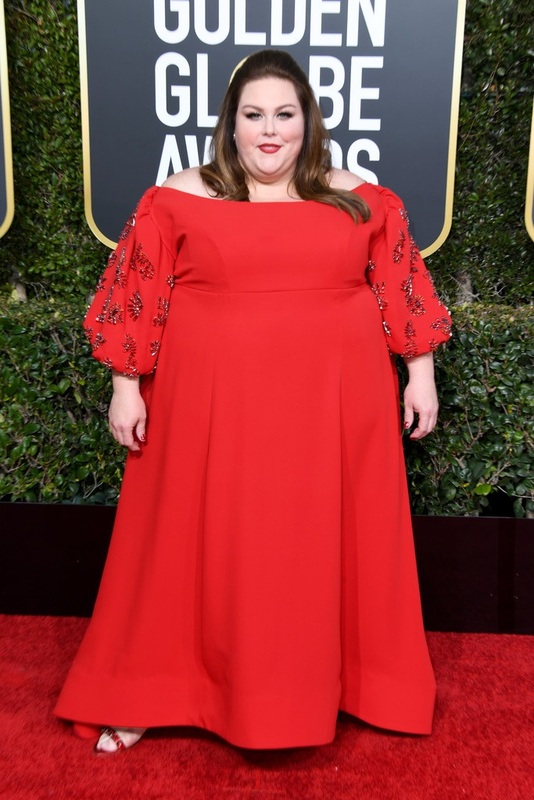 Chrissy Metz has been slaying awards season so far in 2019. 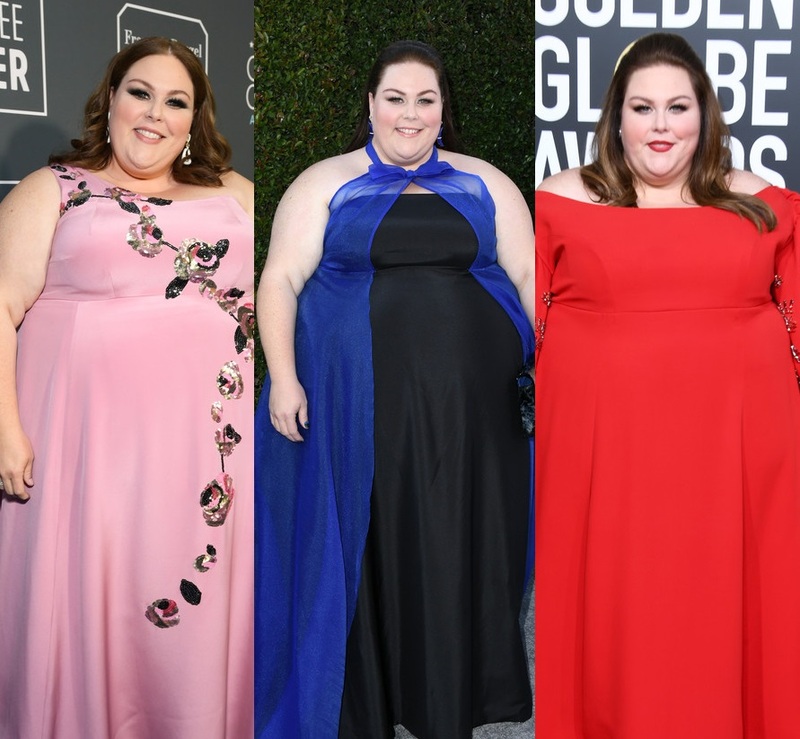 The actress wore three of my favourite glamour looks when she attended the Screen Actors Guild Awards, The Critics' Choice Awards, and the Golden Globe Awards last month. All three custom designs were made just for Chrissy and definitely elevated her style for the awards season. The This Is Us actress wore a pink Kate Spade New York gown with a sequined embellishment flowing across the front of the dress to the 24th Annual Critics' Choice Awards on January 13th. Loved this look! Photo: Emma McIntyre/Getty. At the Screen Actors Guild Awards on January 27th, Chrissy wore a John Paul Ataker gown with a sheer blue halter train. Glamour queen! Photo: Jon Kopaloff/Getty. This Tanya Taylor dress which the actress wore to the Golden Globe Awards on January 6th was Iconic. Shine on Hollywood starlet! Photo: Jon Kopaloff/Getty. Actress Zoe Saldana attended Spike TV's Guys Choice 2015 at Sony Pictures Studios, June 6, 2015 in Culver City, California. Photo: Christopher Polk/Getty. How gorgeous is Amalie Gassmann!! .. she's so pretty. The model attended the Christian Dior Spring/Summer 2015 show during Paris Fashion Week and chose this chic ensemble for her appearance and upon seeing this photo I filed it away in a Drafts folder, but completely forgot that it was there, then just re-discovered it a little while ago after searching for outfit inspiration. Everything about this is near perfection, aside from the drop diamond earrings which I would personally forego for this look,.. the backless black jumpsuit, sleek ponytail, and subtle glam makeup pair very well together. SN: I think I might have a slight obsession with jumpsuits right now.. 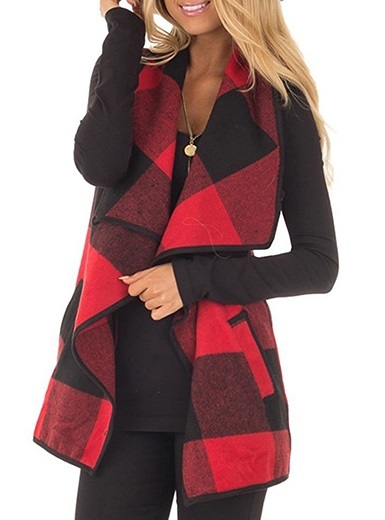 I was trying to think of a face to place this outfit with and then I remembered that Khloe Kardashian rocked cut-off shorts not too long ago, hence the reason that I think she would look amazing in this ensemble. I planned to create this look for some time now, even though weirdly enough this creation started off with the Evans top. The denim shorts via TheBohipstian Etsy shop followed next, then the Saint Laurent ankle boots which were a definite must have after I spotted them, and lastly the Michael Kors cross-body bag was the final addition to this fly girl outfit. Khloe's hair, makeup, and gold hoops are just the perfect finishing touch, no? Khloe's photo: Aaron P/Bauer Griffin. It's still summer and that means that we're still in peak wedding season and if you want to be a bride but you didn't get the chance to be one just yet we've got you covered with these classic all white bridal style inspirations that you can wear everyday. If the origins of this tradition falls into your belief system, great. If it doesn't, it doesn't matter. This is fashion and style, and both are universal freedoms, so have fun trying on these looks, and let us know which one is your favorite. See all of the options.. GUESS WHO: Activist. Music Legend. This recipient of 15 Grammy Awards, and 17 NAACP Image Awards as well as countless other honors is a singer, songwriter, and pianist. Her charting topping catalogue of #1 songs and albums has garnered her an international following and recognition as one of the most popular and successful musicians of the 21st century. She is an advocate and activist who created the We Are Here movement to bring people together to work towards creating positive changes in the world. She is also a philanthropist, and the co-founder of Keep A Child Alive which is an organization that aims to realize the end of AIDS for children and their families, by combating the physical, social and economic impacts of HIV. 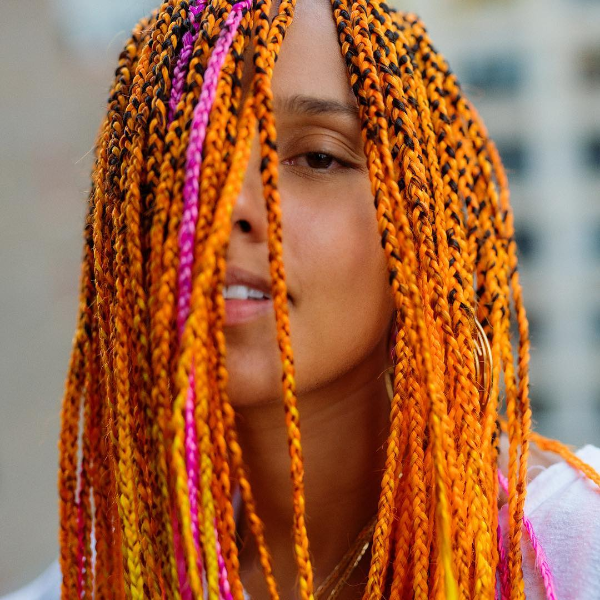 For years now she's ditched the overdone makeup look choosing instead to go makeup less which has consequently made her the face of the no-makeup wave. The message that she has been advocating is empowering and all about self-love, especially for women to embrace who they are, and for us to hold our opinion of ourselves higher than anyone's opinions of us. She's carried those positive and inspirational messages on to the music competition show The Voice where she's served as a mentor to aspiring musicians over the last couple of years.